The jury concluded that the newspaper seller was unlawfully killed by a police officer at the G20 protests in 2009. Ian Tomlinson was “unlawfully killed” by a police officer during the G20 protests in 2009, an inquest into his death has found. 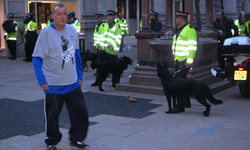 The verdict did not refer to PC Simon Harwood – who struck Tomlinson with a baton and pushed him to the ground – by name, but it has reopened the possibility that Harwood will face charges for his actions on 1 April 2009. The jury found that Harwood’s actions were “excessive and unreasonable” and that Tomlinson “posed no threat” to police. To many, today’s verdict will seem like a statement of the blindingly obvious, however this fails to take account of the significant and many obstacles faced by the family over the last two years to get to this decision. The CPS will now review whether a prosecution will be brought following today’s verdict and the way in which the evidence has been clarified during the inquest process. In response to the judgement, the Crown Prosecution Service has promised a “thorough review” of the evidence – the first step on the road to a potential charge for Harwood. Unlike other verdicts, “unlawful killing” requires the same burden of proof as a criminal trial, meaning that jurors had to reach a verdict that was “beyond reasonable doubt”.